Efficient application for enhancing the photos. 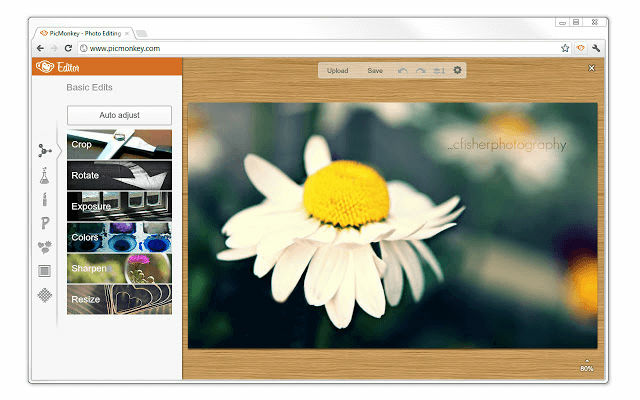 PicMonkey is a digital asset management software used for photo editing by bloggers. It enables you to add design to pictures without using too many functionalities. It offers font book, that contains wide variety of font styles that you can be add to the picture. Along with this, it also allows you to upload font styles taken from the internet sources. This software has easy options to change the colour of the text, center it on the page and send it back or front of the picture. In addition, it offers overlays like animals, stars, labels and banners that you can use in the designs. It has a special feature called Touch Up tool exclusively made for enhancing your selfies. How much does PicMonkey cost ? 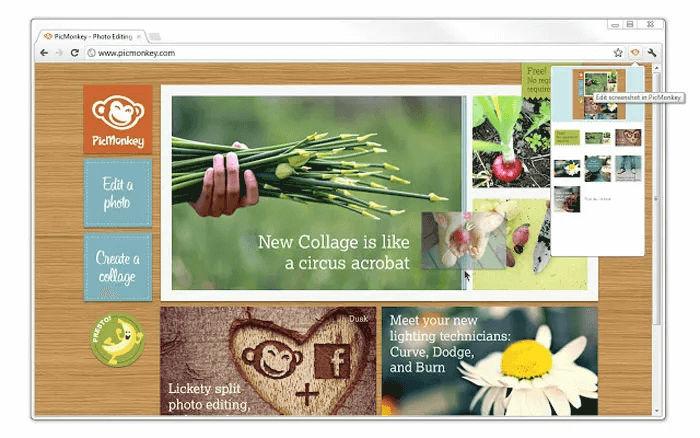 The pricing for PicMonkey starts at $5.99 per month. 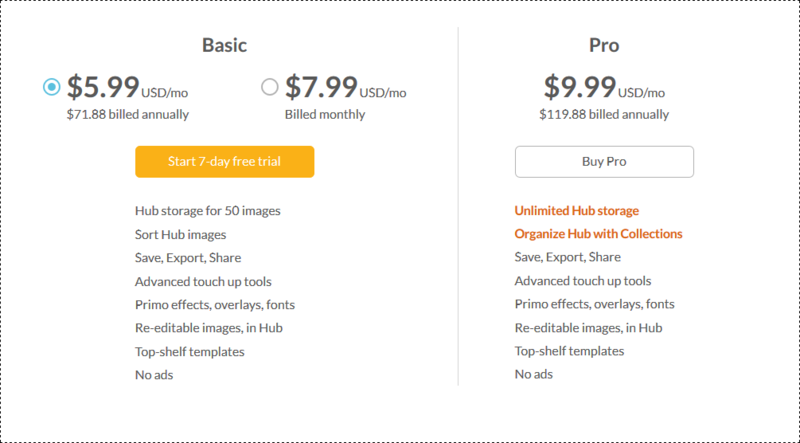 PicMonkey has 2 different plans such as - Basic at $5.99 per month and Pro at $9.99 per month. Cons: There is a subscription option for premium features which I dont find useful as they aren't that "premium"
Pros: PicMonkey's paid program offers a large library of graphics to use, and its CRM is easy to learn to help designers of any skill level produce professional graphics for their clients. Cons: PicMonkey recently changed the look of their program. I prefer the old version. Overall: I use PicMonkey to offer in-house graphic design to clients. Make you social profiles into what your customer likes! Pros: I love the ability to uplift, change and edit my photos and combine them into amazing visuals. The ease of use is on aspect, the features are intuitively put and the pricing is affordable for small business owners starting up. I like the online work away possibility and just download when finished. It saves automatically often so I can go back if I make a mistake on the way. Cons: The new user interface is a bit slow. It is the beta version, but its the best setup to access the different features. It slows the process and lags a bit. But that is it. Overall: I had difficulty setting up my profile images and add the different aspects with other programs. This software does the trick for me. Pros: PicMonkey provides very intuitive and easy to use tools to do a wide variety of image editing. Cons: In my opinion, the subscription costs are now too high for what they provide. Overall: I have used PicMonkey for my nonprofit to do a lot of image editing for several years. Pros: I enjoyed how easy PicMoney is to design simple graphics. Cons: I wish there were more features and the overall operating system needs to be updated to compete with its competition. Overall: PicMonkey is great for my YouTube and Facebook designs I need. It gets the job done! Pros: The best thing I like about this software is that I can make a "Quote" wallpaper from the scratch !! I can design the background, the quote all by myself. Best thing, there is no watermark !!!!! Overall: So far amazing !! Is there any graphic designing software for enhancing selfie photos? Yes. PicMonkey is an exclusive software that provides Touch Up tool to enhance selfie photos.